To blow me away after hearing an artist’s debut once through, it takes a certain dynamic and attention to detail. To put it in perspective, other recent projects that struck me instantly were Kanye and Jay-Z’s, Watch the Throne, and Kendrick Lamar’s, Section 80. And now…Love Junkie. When I listen to Tia London the feeling of, “this one’s got it figured out” quickly comes over me. She’s the total package. She sings, rhymes, and serves up a medley of swagger, grace and sincerity. Now I am paying attention! Surrounding a well-placed feature from Chicago’s own Mikkey Halsted, Love Junkie, is 100% Tia. Tia opens up to her ever-growing fan base on her first major release which indicates a true passion and honesty to the music. One second she is flirtatious but never hesitates to stand up to all the fellas. If I were a psychiatrist, my diagnosis would read, Tia London – Love “Junkie”. After getting some things off her chest, she may have found the cure in this album. Expressions of love both gained and lost, exes, and everything in-between interact with the music as The Legendary Traxster truly impresses. The production is one major stand out as speeds and moods change sometimes within records. Traxster is certainly making Chicago proud. Ladies, go download this. Gentlemen, burn it for your girl and draw some hearts on it, tell her you love her and don’t piss her off. It makes for a better winter. Thank you Tia. You just made 2012 a lot more interesting as the competition for top Chicago R&B artist continues to be a tight one. 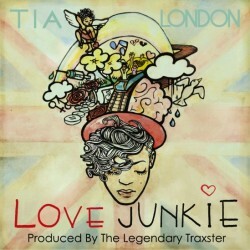 Support Tia and Download Love Junkie HERE! Check out the Official Video for “Nothing On You” below! Follow Tia London on Twitter! Follow The Legendary Traxster on Twitter! Chris graduated from Indiana University in 2009 with a BA in Sport Marketing & Management as well as Business. He contributed to a project called Hip-Hop’s Forum as a writer and promoter. After graduation, Chris worked in sales/marketing and continued to learn the industry, make connections, and help promote up-and-coming artists. With CHHC, Chris will contribute in many formats including marketing, promotions, website/blogging, and covering events/shows. This will only add to his ambition to work in the live entertainment and music industries.